Prepare maps for your holidays, your walking, your bike trips, your geocaching... You can next print them or use them with your GPS! If you think that maps found on the Internet are either not precise, or cover too small areas, MapCapt is for you! Go to the desired Web site, maximize your browser window. Locate the desired area on the map and zoom to the desired scale. In order to MapCapt automatically realize the right scrolling, you have to parameter it according to the Web site. Press the button 1 in MapCapt (see illustrations), next click on the left/top corner of the map. To avoid capturing the toolbar, you can define the corner just below it. Press the button 2 in MapCapt, next click on the right/bottom corner of the map. MapCapt has three different capture methods. Click / Drag control (mouse). The easiest method, to be used when the map moves when maintaining mouse button down on the map while moving the mouse. Most of the time, you can leave the four error parameters to 0. Check 'With spacebar down' when the map moves only when the spacebar of your keyboard is down. To be used with onscreen controller. Tip: a classic window scrollbar can be considered as an onscreen controller. This method needs more parameterization. Press the button 3 and next, click on the control which scrolls the map towards east. Repeat this step for the west, south and north controls (buttons 4, 5 and 6). MapCapt also needs to know the amount of pixels for each scroll. Choose the button 7 and click next on a reference point in the map (in the bottom-right area of the map). This position must be precise, use the zoom window. By pressing the button 8, MapCapt will scroll the map once towards east and once towards south. Press the button 9 and click on the same reference point (which has scrolled); use once again the zoom window. The displacement is now computed. To be used when map moves with the arrow keys of the keyboard. You can now Save the settings for future use; each Web site will have its own settings. Prior to start capturing, set the amount of horizontal and vertical steps you desire (free version is limited to 2 horizontal steps and no vertical scrolling). When MapCapt has finished, you'll see a dialog box to choose where to save the final image. 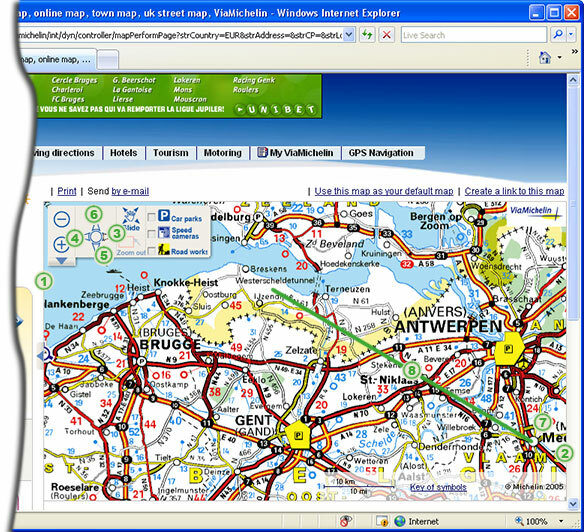 MapCapt may not be bundled with other software, included on CDs etc, linked to from other web sites or made available for download elsewhere. Link to this page instead. MapCapt.exe for Windows 10, 8.x, Windows 7, Vista and XP SP2/SP3 (free version: two horizontal steps and no vertical scrolling limitation). Follow a road with the manual scrolling function. Autocorrect some small misalignments problems. New: with version 2.5, interactively define and preview the area to capture. It's fast and easy. Just click on the 'PayPal' button below. Bonus: all donators can ask for GMItoMAP which converts calibrated map files from GPS Tuner (.gmi) to OziExplorer (.map). This software is provided for demonstration purposes only. Personal use only. Use at your own risk. No technical support given. Don't copy or distribute copyrighted media. 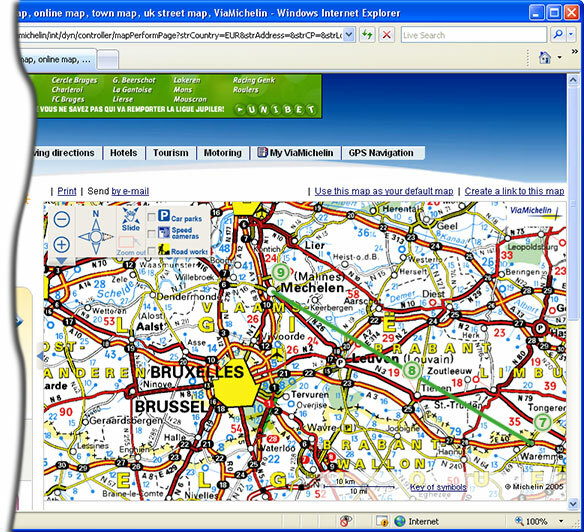 Some Web sites can distort a little their maps so they don't align perfectly (for example www.mappy.com). Screen captures will never replace a bought genuine printed map.